I finally stock up on supplies! I've been struggle for about two weeks because I had to make a new item with limited supplies. Believe me, having a limited supplies is not helpful at all. Let me tell a bit of story about the place that sells this supplies. I got these supplies from Cigondewah, an area in West Java where supplies shop are lining, mostly selling fabric and some other supplies. Because the supplies they sell are left overs from factories/manufacturers, they have many kinds of items with a wide range of quality. You have to be a smart buyer if you want to shop here. If you want to bulk buy, you can combine any items freely. 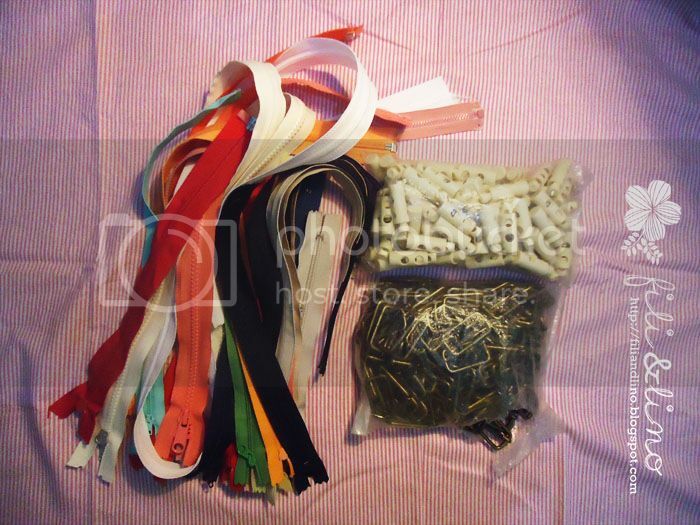 I bought 1 dozen of zipper and I can mix the big 16" red zipper with a small 11" yellow zipper. The fabric shops there are mostly selling fabrics per kilogram. You can get a LOT of fabrics in a very cheap price that can support your fabric needed for the rest of your life. But again, be a picky buyer. So far, I still can't find fabrics that can satisfy my taste. It seems that I need one separate post to describe the fabrics' characters that are sold there so I'll skip the detail here. The transportation is not well managed. You can visit every shop foot. It won't be a problem if they facilitate a good sidewalk for pedestrian and not force us to walking side by side with a car every five minutes. There is an unpredictable wagon that appears like one time per decade for you to ride and a rickshaw to take you to other section in further areas.